A pair of 1964 films detailing the construction of Stanford Linear Accelerator Center, later renamed SLAC National Accelerator Laboratory, were recently remastered and are now available for viewing on YouTube thanks to a partnership between the films’ producer, J. Douglas Allen (pictured), and the SLAC Archives, History & Records Office. The films provide a fascinating look back at the origins of SLAC and the history of particle physics in the United States. At the time of the production, SLAC was the largest civilian basic science project ever undertaken in the United States. The site where it was being built, along Sand Hill Road in Menlo Park was then largely orchards and pasture. Today the region is known as Silicon Valley and considered an unparalleled cradle of innovation. 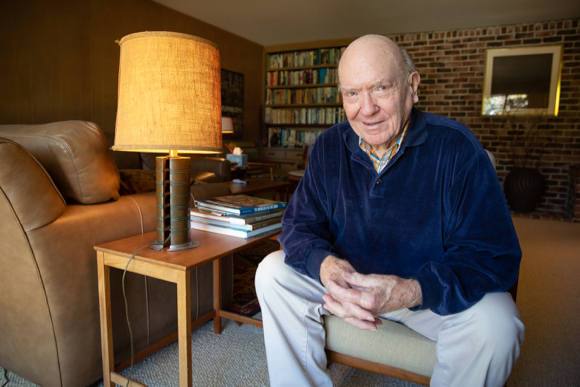 He would go on to devote most of his career to his interest in aviation, making films for the Hiller Aircraft Company, Evergreen Helicopters, Gates Learjet Corporation and many others, but he still recalls the SLAC project fondly. He became close personal friends with Sigurd Varian, a fellow aviation enthusiast who co-invented the klystron technology that power the linear accelerator with his brother, Russell Varian. Allen still has a lamp made from a piece of the accelerator structure in his living room (shown sitting beside him in the photo).